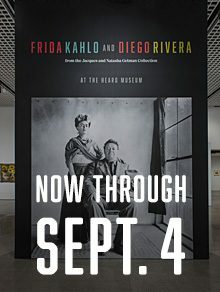 The exhibition Frida Kahlo and Diego Rivera will remain open through Labor Day weekend during its only North American stop. The Heard Museum is extending its Frida Kahlo and Diego Rivera exhibition through Monday, Sept. 4, citing overwhelming response and support from museum visitors and the community at large. The exhibition, the only North American stop on a limited world tour, opened in Phoenix in April. Already, nearly 80,000 have toured the exhibition, which has gained international attention. On Fiesta de Frida, the Heard’s First Friday event to celebrate Frida Kahlo’s birthday, a line of more than 3,000 visitors stretched from the gallery entrance, across our eight-acre campus to Central Avenue despite the 115-degree temperature outside. The exhibition originally would have closed after Aug. 20. More than 30 works are being shown in the Virginia G. Piper Charitable Trust Grand Gallery. The works are from the Jacques and Natasha Gelman Collection, and include Kahlo’s Self Portrait with Monkeys and Diego on My Mind, and Rivera’s Calla Lily Vendor and Sunflowers. For more information on the Frida Kahlo and Diego Rivera exhibition, visit here.